Cedarville’s Maggie Coe reacts from the bench as fellow senior Sydney Wright (10) puts up a jump shot in the second half of a Division IV first-round sectional basketball tournament game against Miami Valley Christian Academy, Feb. 13 in Monroe. Cedarville sophomore Elly Coe (32) races in for a first-half layup, Feb. 12, in a Division IV sectional first round win over Miami Valley Christian Academy, at Monroe High School. 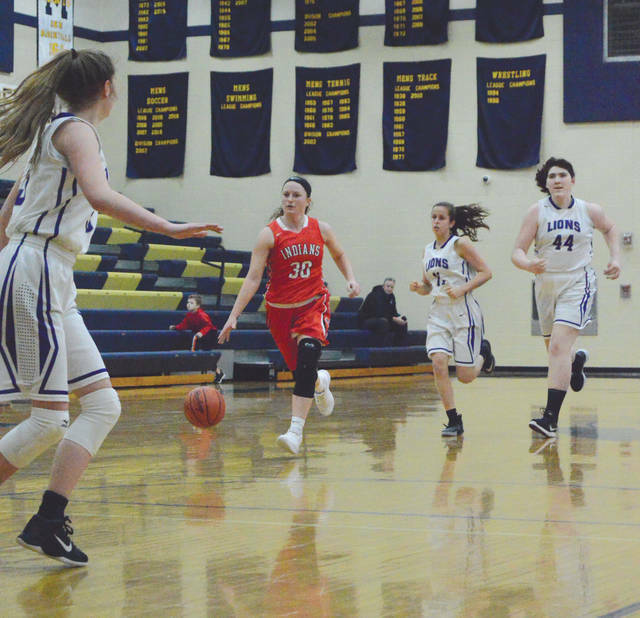 Senior Maggie Coe (30) played sparingly in the second half of a 50-21 first-round sectional tournament win Feb. 12 over Miami Valley Christian Academy, but still led everyone in scoring with 22 points. Cedarville senior Kaylee Cyphers (24) battles Abbie Lusby of Miami Valley Christian Academy for the opening tip-off, Feb. 12, in a girls high school basketball sectional tournament opener at Monroe High School. 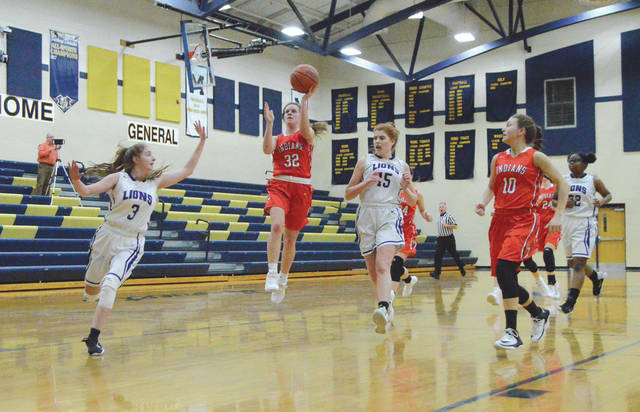 MONROE — Second seeded Cedarville shook some first-quarter jitters away, then put away a youthful Miami Valley Christian Academy team, 50-21, in the opening round of the Division IV girls high school basketball sectional tournament, Feb. 13 at Monroe High School. 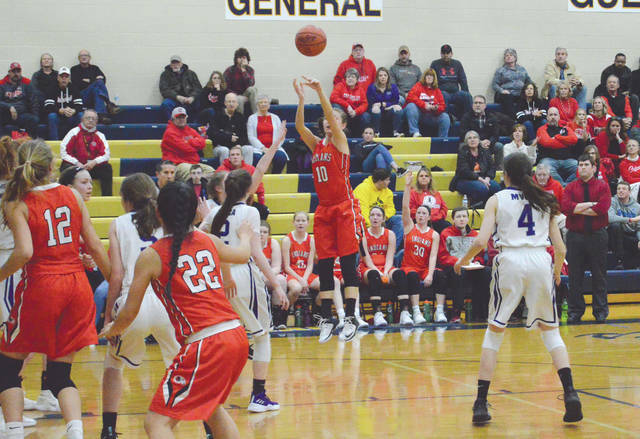 The favored Indians turned the ball over on their first three possessions of the game before senior Sydney Wright scored on a steal and subsequent layup some 90 seconds into the game. Cedarville shut out ninth seed MVCA 12-0 in the opening quarter of play, and was never threatened. Ohio Heritage Conference scoring champ Maggie Coe finished with a game-high 22 points, Ciara Horney scored 10 second-half points, Sydney Wright scored eight, Luisa Christian scored four points, while Kaylee Cyphers, Elly Coe and Ruby Stack scored two each in the win. 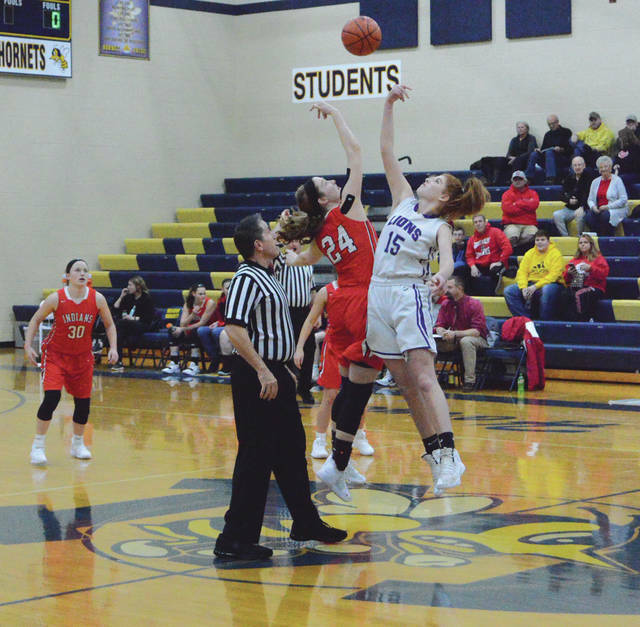 The Indians, now 17-6, advance to take on 13th seeded Felicity Franklin in the tournament’s second round at 6 p.m. Tuesday, Feb. 19 at Monroe High. “I think for the first time out, we did well,” Indians coach Josh Mason said. “We do have a couple girls who aren’t used to playing this many minutes in a tournament game, so it was good to get them that experience. Driving an hour. We had to get used to driving an hour and coming here to play. … But most of all, we’re enjoying every minute of playing. Mason said he spoke with the team prior to a game with league rival Greeneview, and he tried to emphasize the importance of just enjoying each day they had to play the game of basketball together. It wasn’t until an Indians senior spoke up that the team truly bought into it, however. “We had a senior meeting before the Greeneview game, and the seniors got to talk to the team and share their favorite memories and offer up some advice. One of our seniors, Ruby Stack, her advice was simply two words: ‘Enjoy it.’ When coach says it, you get some of them to follow. But when a senior says it, everyone believes it! MVCA coach Suzy Osterman appreciated her team’s effort, despite trailing 26-3 at the break. Six of her nine players are either freshmen or sophomores. Freshman Kaylee Grosjean scored all 11 of her team-leading points in the second half, including three 3-pointers. Junior Alecia Grosjean was next with five. Sophomore Mya Chambers didn’t score, but she had several steals in the game. MVCA finishes the year with a 6-14 record.